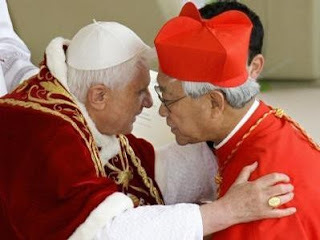 It is not true that the letter Pope Benedict XVI wrote to Chinese Catholics says that bishops from the underground Church can concelebrate services with “all” bishops from the official Church. It is not correct to claim that the letter says that there are no more reasons for the existence of the underground Church or that “underground” bishops are urged to seek recognition of state authorities. It is not true that there are no more canonical sanctions against unlawfully ordained bishops. This in a nutshell is the reply Card Joseph Zen Ze-kiun, bishop of Hong Kong, delivered to a July 6 article by Fr Jeroom Heyndrickx, head of the Ferdinand Verbiest Foundation at Leuven’s Catholic University (Belgium), that appeared in the UCA News agency (the cardinal’s reply was published on July 18 and Father Heyndrickx’s counter-reply on the 20). This is the same Mr Liu who is the CCPA deputy chairman and whose “enormous power . . . has allowed him to oppress and humiliate our bishops. At the centre of the controversy is Father Heyndrickx’s interpretation of the Pope’s letter. According to him the letter encourages members of the underground Church to come out into the open, ask for recognition by the civil authorities and concelebrate services with “all” the officials of the official Church. Cardinal Zen states that none of that is in the letter—there is especially nothing to suggest that bishops from the underground Church can concelebrate with “all” the bishops from the official Church. What the letter does say is that they can concelebrate only with those who are now in communion with the Holy Father. In this sense, the unity of the Eucharistic celebration is obviously important, but without a hierarchical communion it is only a lie.